It is time for a good news - the new 1.1.0 release of Computer Vision Sandbox is out and available for download. In addition to video source plug-ins which were introduced in the 1.0.0 release, this one introduces two new types of plug-ins: image processing and video processing plug-ins. 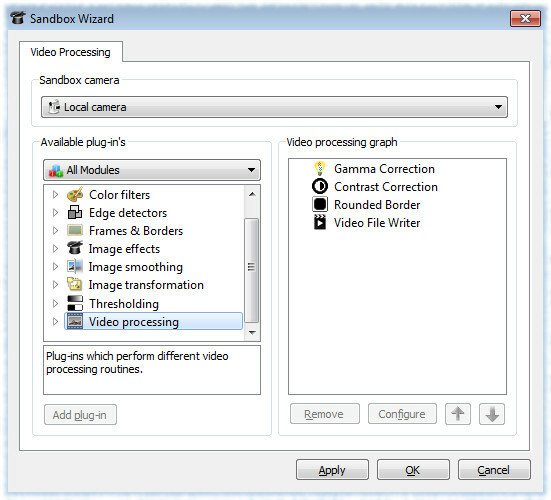 Those plug-ins are available from a new Sandbox Wizard tool, where a video processing graph can be formed for each camera added to a sandbox. Combining different plug-ins into a sequence it is possible to achieve different results aimed to solve different tasks. So far the number of available image/video processing plug-in is limited - the support of new plug-in types was just introduced. However more new plug-ins will become available with new releases increasing the number of tasks those could solve. The new version also introduces plug-ins' help system, which allows to get description about every plug-in added to the application, their properties and possible values, etc. More about the new features can be found in the two new tutorials: Sandbox wizard introduction - image processing and Video writing - from single file to video archive.